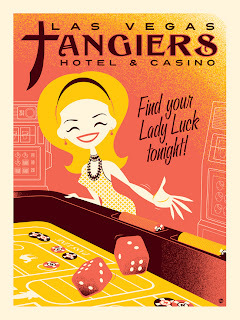 This is my "Casino" inspired piece for Spoke Art's tribute to Scorsese show that opened in NYC last weekend. Always felt Casino was an underated Scorsese film and loved the fact that the F word is uttered a whopping 398 times during the course of the movie, the edited for TV version is a real hoot with such classic redubs as "Forget me? Forget you you mother forgetter!" There are a few prints left now available online HERE!